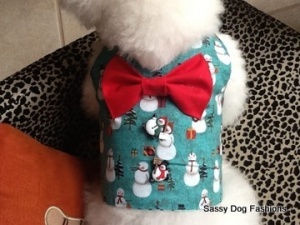 In addition to our handmade, ready-to-wear pet apparel, we, at SASSY DOG FASHIONS, already offer a variety of customizable dog coats and clothes, pet accessories and pet dog lover gifts. 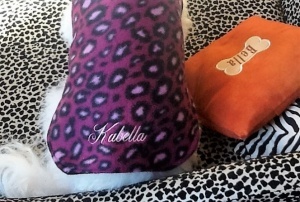 Most of our products, which you can find in our store, can be personalized by adding your pet’s names. 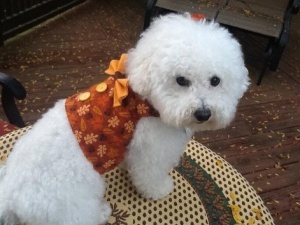 In addition to what we offer in our store, we will design and create for you, your custom PET clothes, MADE TO ORDER, that you do not see in our store. With customized dog products, the sky is the absolute limit and we welcome all your custom order requests! Most dogs will fit into our standard fit patterns however If you request a dog coat or fleece sweater for an odd body dog’s dimensions, altered length or chest measurements or even in a special fleece color—it’s considered a custom order and charges may apply and are payable by Paypal or Square, prior to starting the job. We are pattern makers so we can draw or alter any dog coat pattern to fit your odd body. Please have your dog’s measurements ready for Neck, Chest and Back Length. 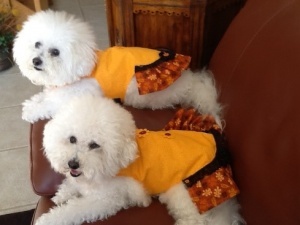 We design and sew custom dog clothes for odd bodied dogs such as Labradoodles, Teacup Chihuahua and Yorkies, Bulldogs, Pugs, Miniature or Standard Dachshunds (Doxie), Wire Fox Terriers and many more. We can tailor a glove fit for any dog body! 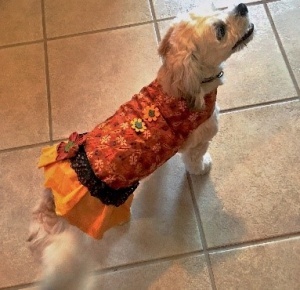 A professional seamstresses can alter garments so perhaps you have a skinny long body dog; if so, do not hesitate to make your custom request for your your pet’s apparel! 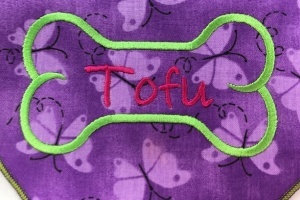 For your custom tailored dog coat or garment you may also order name personalization as that is our signature service. You may design your own dress, too or change the thread color. 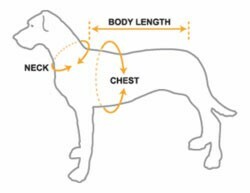 If you need a longer back length on your dog’s designer coat, we will just draw your coat pattern longer. If your designer Burberry-inspired dog collar is too bulky for your teacup’s fragile neck, we can rid the strap of the bulk. Our most popular tailoring work is done on designer dog coats because people just want to know it’s not going to look like another ill-fitting pet store jacket. Below, Yocco the Doxie received his very own hand towel for his wet paws and his monogrammed dog place mat and Tofu received a hot new bandanna with a dog bone around his name. We have access to thousands of fabrics and over 300 thread colors and thousands of embroidery decorations and fonts so if you see a style you like, we can create almost anything for you. The design and production services begin after you pay for your custom order. Make your custom request to receive a FREE QUOTE! Everything is explained and approved in advance and all payments are due in advance. 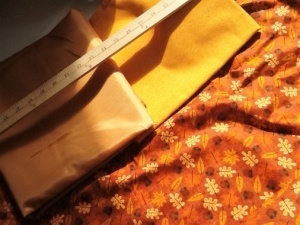 As a rule in the sewing industry, custom sewing orders are never returnable or refundable. So if you need a patriotic, Christmas Holiday or Autumn themed item for your little man or gal, simply request it! Designing and finding the right supplies takes time and this is how custom dog products are designed and made JUST FOR YOUR DOG’S UNIQUE MEASUREMENTS! We spend a lot of time designing, shopping and we incur expenses hunting down the right thread color, the perfect fabric or sorting through thousands of embroidery images, we then test the design to make sure it is practical. The results are always fabulous. We spend a lot of time communicating with you back and forth and shipping your supplies in, takes even more time and involves even more costs. Custom order fabric and supplies takes a week to arrive and we appreciate your patience in processing your custom dog lover gift order or your personalized dog or fleece jacket. We can order wool plaid from Ireland. Do not be surprised at the amount of work that is involved to make your specialized dog pet gift orders. All our animal items are hand-made right here in Pennsylvania. We don’t use machines to cut multiple layers of fabrics like in China; they are all measured manually here and cut one by one for absolute precision. People who engage us to work for them understand the costs involved and the product and service provided them which they cannot get anywhere else. We have access to doxie fabric, hunting dog fabric, fish fabric, cat fabric, dog bone fabric, paw print fabric and much more pet animal novelty fabrics. If you would like a dog breed tote bag hand-built just for your favorite breed, we can find the novelty fabric and sew it. Or if you would like your kennel name on your dog breed tote, we can do that in a single order or in quantities. 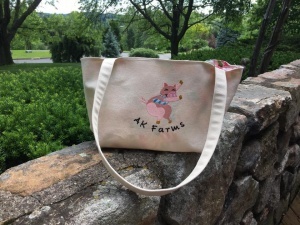 We create custom dog grocery totes and even tote bags for pig breeders with pigs on them, for horse lovers and even for craft beer drinkers and even show dog folks. Show handlers and judges and breeders love our JUMBO breed totes because you can fit a lot into them. We can also do themes that are not pet related. 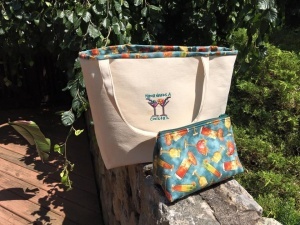 We can always change the tote bag liner for you on our existing bag or alter the embroidery image on the front of the tote. Request a FREE QUOTE today for your custom job. We have state-of-the-art commercial embroidery machines on site so we are able to customize your garment and dog products with just about any embroidery image or monogramming font you need. Requesting a custom embroidery image means we hunt it down or design it, test it out, size it for the garment, etc. If you can dream it, we can do it. For example if you would like bath towels with the family’s dog breed, we can do it! Or custom beach towels! Or pajamas for Christmas Eve for all your fur babies personalized with each of their names! We’ve also done pajama orders for people that matched their dog’s pajamas. 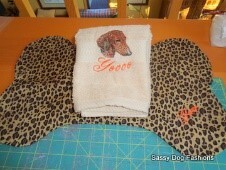 If all four of your Doxies need the same fleece jacket, we can sew them easily. Always ask! We offer dog lover gifts such as pet themed hand towels and pet themed tote bags. Choose from over 100 gorgeous, award winning, photo-quality embroidered dog, cat and horse breeds. 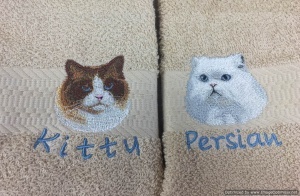 The hand towel is either sold with your pet’s name or left general with just the dog breed i.e. “Labrador” embroidered on the towel. 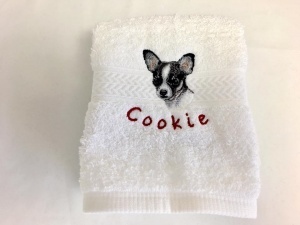 Most people order the pet gift towel customized with their pet’s name. You may visit the dog lover gift towels on this site to see the pet towels and the pet tote bags. Any variation can usually be done, simply contact us. 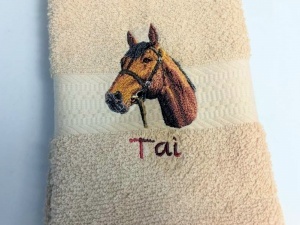 In regards to our Personalized Dog, Cat and Horse Breed Hand Towels, requesting a different color towel is possible and if you prefer a luxury towel from Nordstrom or Macy’s, we can also have them sent in for you as a custom request. 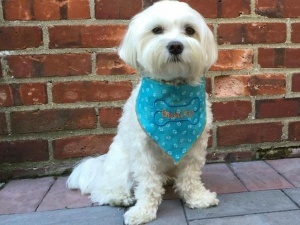 Many of our pet products can be personalized and customized. So if you don’t see it, simply call or email us! 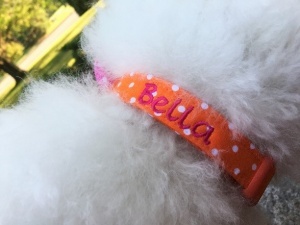 Many products can take a pet’s name easily and it’s only $10 to add a name to anything. Each name must not exceed eight (8) characters or you may make a custom request if your name is longer. 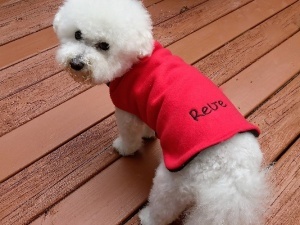 Personalized Dog Lover Gifts and Custom Designer Dog Coats and Sweaters are the Greatest Gifts to Give! Nobody but YOU will have these specialized pet products and they will be a unique and stylish dog gift for yourself and your family and everybody will know your dog’s identity with his name on his coat or fleece! Once the dog has his own identity visually, we can focus on loving him or her even more. Personalized monogramming gives your dog more meaning. Offering a personalized pet lover gift is a very unique gift to give someone on your holiday Christmas Pet Lover Gift List and you will feel confident that your boss, client, teacher or family member or friend will have the most appropriate pet gift for them. Remember! If you don’t see it! Ask for it! 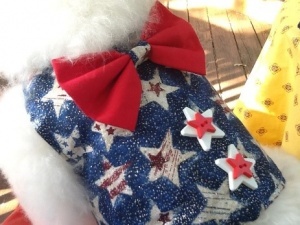 Personalized designer dog clothes and accessories by Seamstress Auntie M. Using only premium supplies. Unique Dog Lover Gifts. MADE in AMERICA. CopyRight © 2018 Sassy Dog Fashions. All rights reserved.